So far this bubblife has been amazing but what I'm about to do on May 6th, 2001 has got to be one of the highest moments of my career. I will be blowing bubbles on stage with 300 members of the Northwest Girls Choir at Benaroya Hall, the premier symphony hall in Seattle!!! And the song they are singing is about me! You just might see Garry Golightly, the Wallingford Bubbleman. God bless the Bubbleman. God bless the Bubbleman. Catching magical bubbles in the palm of his hand. "Look what the Bubbleman gave to me. Look what the Bubbleman gave to me. 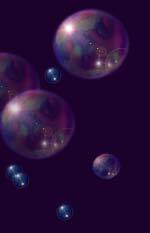 Look what the Bubbleman gave to me from soap-bubble land." Bringing laughter to children and his card to their moms. He's a perfect stranger but he's a 'perfect' stranger! Bringing windows of wonder and love through the land. With his handlebar mustache and his purple-blue van. 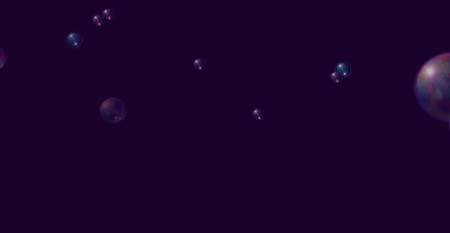 Blowing magicle bubbles that float to the sky. Bringing laughter to children and a tear to my eye. "Look what the Bubbleman gave to me! Look what the Bubbleman gave to me! 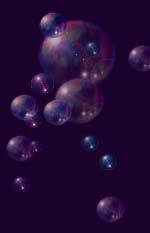 Look what the Bubbleman gave to me from soap-bubble land!" 1 thirty gallon bucket (trash can). 24 ounces of Joy or Dawn Dish Soap. Put the 5 gallon bucket inside the 30 gallon bucket and fill the 5 gallon bucket with water one inch from the top. The reason for the 30 gallon bucket is threefold. Safer for children playing with 5 gallons of liquid. No chance of spilling the bubblejuice. Excess suds scooped into the big bucket make for more bubblejuice the next day. Pour 3 cups (24 oz) of Joy or Dawn...no more...no less. Now you have 5 gallons of Bubble Juice for pennies! Use almost anything plastic with holes to make bubbles. Use your own imagination. Better yet. Let you child use his/her own imagination. Always remember that cool, calm, cloudy weather is good bubble weather!